One of the questions I get asked the most frequently is about my skincare routine. I am a firm believer in the importance of seeing a dermatologist, not just to have your skin checked regularly, but also to discuss any issues you’re having. The doctor I see has been a wealth of information and she has opened my eyes to things I was doing that were damaging my skin that I wasn’t even aware of. So, today I’m sharing some of that wisdom with you & providing six simple steps you can take to achieve your best skin ever! These are areas that could be affecting your skin & potentially causing irritation and unwanted blemishes. 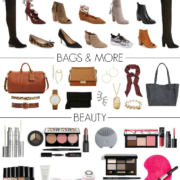 Making a few small changes can have a huge impact and might just solve your skin problems! There was a study conducted recently by the London School of Hygiene & Tropical Medicine where they took 780 swab samples off of iPhone surfaces & discovered that 82 percent of phones had some type of bacteria on them. This is especially important for those of you who have to be on the phone a lot for work or if you have friends & family that live far away (I spend at least an hour each week talking to my parents). If you’re noticing breakouts along your jawline, this could very well be the culprit. The ideal option is to use ear buds instead, but you should also make it a point to clean your phone screen every week with santizing spray & a microfiber cloth just to be sure that all traces of oil & bacteria are gone for good. If your morning routine involves showering & styling your hair before applying makeup, you don’t want to skip this important middle step. There are so many ingredients in hair products like mousse or root lifters that can leave a residue on your hands, which you don’t want to have transferred to your face. Because my skin is fairly sensitive, my dermatologist recommended that I wash my hands with soap after styling my hair & before I put on my makeup primer to help avoid unwanted irritation from chemicals in my hair products. Between your hair & skin, there’s a lot of oil (& potentially bacteria) that can collect on your pillowcase. Not washing yours frequently enough & continuing to sleep on it can cause breakouts, so I recommend switching yours out once a week to ensure you’re resting your head on a clean surface each night. It’s now become a habit for me, but in the beginning, I found the easiest way to remember was to set a recurring event in the calendar on my phone so it would alert me every Sunday that it was time to change my pillowcase. I’ve mentioned this before (here), but it’s especially important if you’re heading to the gym after work and you have a full face of makeup on. Sweat mixed with makeup can dry on your skin, clog pores & cause blemishes if you don’t wash your face and/or shower shortly after you exercise. I like to take POND’S Towelettes with me to the gym, so I can use them immediately after I exercise – they clean my skin & remove any leftover traces of makeup + they are cool & soothing after a long hard workout. I know it’s important to wash my makeup brushes regularly, but so often I forget to make time for it or it simply slips my mind. So, I was happy to discover a quicker way to clean mine when I’m short on time or traveling. 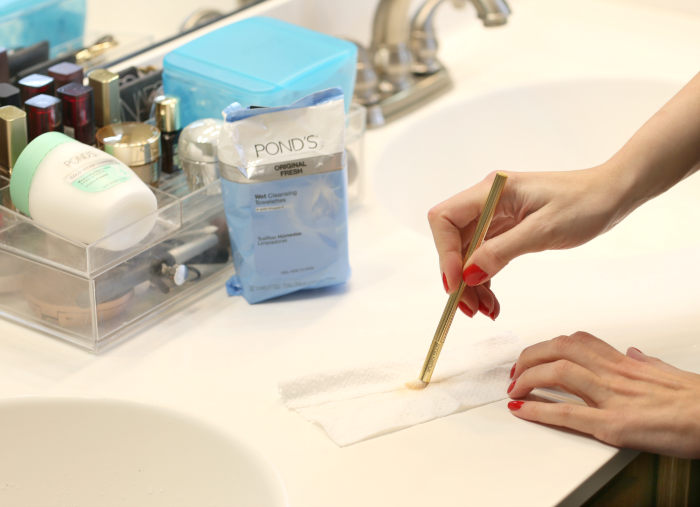 Using the POND’S Towelettes, I just swipe the brush back & forth on the surface of the wipe to remove any buildup until no more product is coming off of the bristles. Then, I give it a few minutes to dry before using to apply makeup – simple, quick & effective! For deep cleaning, I use organic Castile soap because my sensitive skin doesn’t react to it. I also swear by this cleaning mat, which makes it so easy when you’re doing a bunch of brushes at once. If you place them right side up to dry, the water can run down into the handle & cause rust – so I recommend either lying them flat to dry or using a brush tower like this one that will dry & reshape them perfectly every time. It’s a rule that should go without saying, but I actually have a lot of girlfriends who admit to skipping this step occasionally, so it’s worth reinforcing here. I completely understand how you can get to the end of the night and feel so exhausted that all you want to do is fall into bed. To solve for this, I keep a stash of POND’S Towelettes on my nightstand. Then on evenings when I’m too tired to make it to the bathroom, all I have to do is grab one while laying in bed and, in a few quick swipes, I can remove my makeup, clean my skin & then I’m off to sleep. This post was created in connection with my appointment as Influencer for POND’S. Visit POND’S Pinterest for more skin care tips.